Award winning beaches, soft sand, arcades, and tax-free shopping are a few of the things that make Rehoboth Beach, Dewey Beach and the Resort Area the ultimate year-round and family-friendly destination. In 2017, the Resort Area was featured in a USA Today article titled "Climate, friendly businesses make Delaware beaches a year-round destination”. Rehoboth Beach was also featured in the article "11 Mid-Atlantic Small Towns That'll Charm Your Socks Off" by wheretraveler.com. This is the kind of place that hosts Sandcastle Contest, fireworks and free Bandstand performances, all equally popular with kids and adults, visitors and locals. Dewey Beach hosts Monday night movies, and Tuesday and Wednesday night bonfires. Mark your calendars for the area’s newest event in June, Beach Goes Blue…Red & White, Too! honoring our Military and first responders! Not convinced yet that this is one of America’s most family-friendly destinations? Well, then take a look at this list of eight of the best things to do in Rehoboth Beach and Dewey Beach with your families. Readers of Coastal Style Magazine voted the local Sea Witch Halloween & Fiddlers' Festival® a 2015 "Best Of" winner. The Sea Witch® Halloween Festival draws approximately 200,000 visitors every year who love it for its costume parade full of ghosts and goblins, the best costumed dog contest, amazing musicians, horse shows on the beach and live entertainment. Youngsters can join a Kid’s Treasure Hunt, and ride ponies on the beach. Families can make scarecrows or try old-fashioned beach games such as the wacky Broom Tossing Contest. More than 100 eateries operate in the one mile square downtown area of Rehoboth Beach, and when combined with the Route One Entrance and Dewey Beach, there are over 100 more in the Resort Area. The Culinary Capital of the Culinary Coast features seafood-focused menus, coffeehouse retreats, ethnic cuisine and comfort food—and most restaurants cater to kids. Classic cinnamon rolls, cookies, and house-made pies delight families visiting The Point Coffee House and Bake Shoppe, as well as fresh sandwiches and salads. More great happy hour pricing meets terrific burgers and stellar seafood at Fork & Flask at Nage, making upscale family meals more affordable. For a romantic, adult Italian spot, consider Ristorante Zebra, located inside a Victorian beach house with a cool, upscale safari theme inside—though the outdoor deck is an equally appealing option during warm weather months. Check out one of the newest restaurants at the Beach, Blackwall Hitch which offers a high quality, contemporary setting yet comfortable gathering place in the ocean block of Rehoboth Avenue. If you are looking for local seafood, make plans to dine at Starboard Raw in Dewey Beach and enjoy a Baltimore style oyster bar with Dewey Beach Flair. If steamed crabs are on the menu, stop by the fun and family friendly Crab House on Coastal Highway. And don’t miss the famous kid- and family-friendly Nic-a-boli, a local favorite, at Nicola Pizza. A warm-weather trip to the Rehoboth Beach and Dewey Beach area isn’t complete without, well, a trip to the beach. Frommer's Travel Guides named Rehoboth Beach among its 20 best vacation destinations, and it has been called one of the cleanest beaches in the United States. Long stretches of warm, soft sand flank brilliant blue to deep turquoise ocean waters. There’s plenty of space to spread out towels beneath umbrellas and plenty of lifeguards on hand to assist swimmers of all ages. For leisurely views of local plants, wildlife and water, Cape Henlopen State Park includes trails with varying degrees of difficulty and length. The Gordons Pond Trail features crushed stone that easily accommodates hikers, bikers and strollers. In addition to forested areas, open fields and marshes, this lovely park is home to a pavilion, concessions, and two iconic WWII towers. Bird watching is a favorite pastime in spring and fall. Twelve feet wide and six miles long, the handicap accessible Junction and Breakwater Trail is created with crushed stone and equipped with restrooms and bike racks. The trailhead begins at the historic Wolfe House and meets Tanger Outlet Center. When you need a break from seeking shells, sunbathing, swimming and water sports, more than 100 familiar outlet stores in the Rehoboth Beach area sell big-name brands—and all shopping is tax-free. 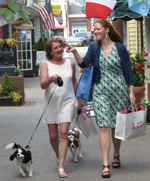 In addition, there are dozens of individually owned boutiques and galleries operating in Rehoboth Beach. Shop ‘til you drop for everything from souvenir T-shirts and sunglasses, to bright and beautiful swimwear and fun and funky unique clothing and jewelry. Create and purchase a photo of your family dressed in period garb from the early 1800s through 1930s set against elaborate sets designed to represent each period at Yesteryears Old Time Photos. Water activities are a big part of enjoying these Delaware beaches year-round. Whether you rent bright-hued, stand-up paddleboards, paddle through calm waters in a kayak or catch the summer breeze from a small sailboat, there are many possibilities for enjoying the water that go beyond a quick dip. For an added dose of adventure, hop aboard a jet ski or try skimboarding or parasailing in Dewey Beach. You can take a three-hour kiteboarding lesson or glide through local waters on a full-sized surfboard. In addition, eco-tours by kayak will introduce your family to water-loving wildlife as well as a water taxi across the bay. Beach fun extends to tours through the watery depths of Rehoboth Beach-Dewey Beach. Late July through early October is the perfect time for dolphin-watching when the gregarious mammals often swim just off the shore. Whales are occasionally spotted in the area and whale-watching cruises are within an hour or two from the shore. Several companies offer close by dolphin cruises too. For added fun, check out ‘pirate cruise for kids’ with Captain Barry Askew, and Pirates of Lewes Expeditions. For the price of a donation, Rehoboth Beach Museum will introduce your family to the legacy of fun at Rehoboth Beach, through its history, culture and architecture. Check out vintage bathing suits, surfboards and even archaeological artifacts. Antique postcards provide black-and-white glimpses of beach life too. Founded by the nonprofit Rehoboth Beach Historical Society in 1975, the museum is located inside Rehoboth Beach’s former ice house, and maintains the Anna Hazzard Tent House—a turn-of-the-century “tent” house where religious “Camp Meeting” gatherings took place. The museum runs children and adult programs throughout the year. Want more ideas for family fun? Download the Rehoboth Beach and Dewey Beach Visitor’s Guide and start planning fun, family-oriented beach vacation. You can also Book Your Stay Now on the Chamber's website! Follow the Chamber on Facebook and Twitter.